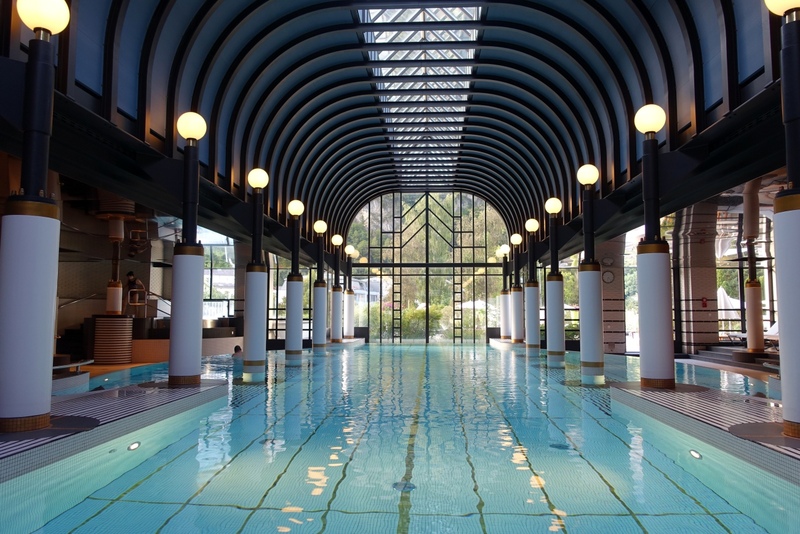 The Victoria-Jungfrau Grand Hotel & Spa is in Interlaken, Switzerland, a must-visit destination for those wanting to visit the Jungfrau summit in the Bernese Alps, and adrenaline junkies keen to enjoy skydiving, paragliding, white water rafting and biking. The hotel dates back over 150 years to the modest Pension Victoria, which in 1899 joined with the nearby Hotel Jungfrau. 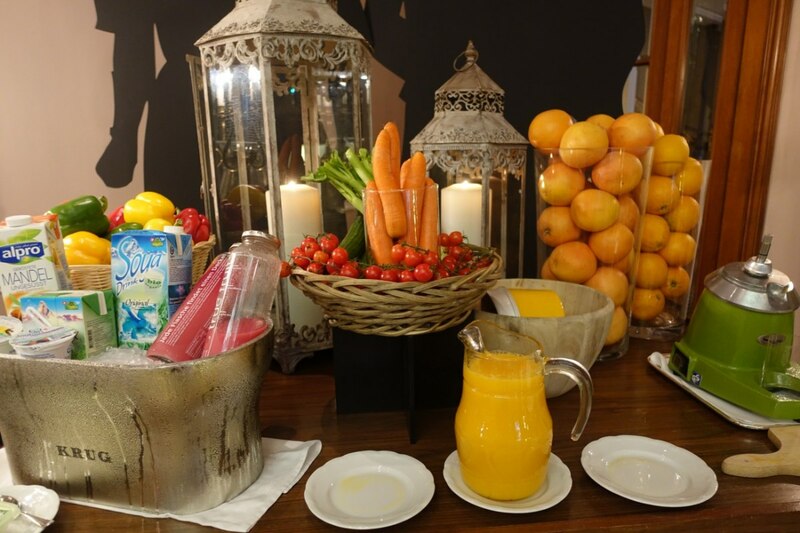 The hotel was recently renovated, in 2015, and nearly half of its 224 rooms are Junior Suites and Suites. Interested in a trip to Switzerland? 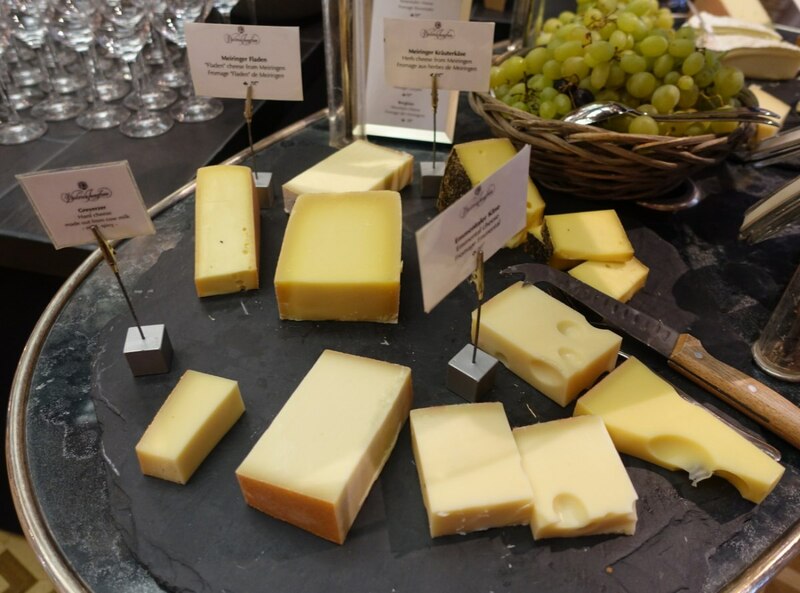 See 8 Things I Love About Switzerland and all posts tagged Switzerland. 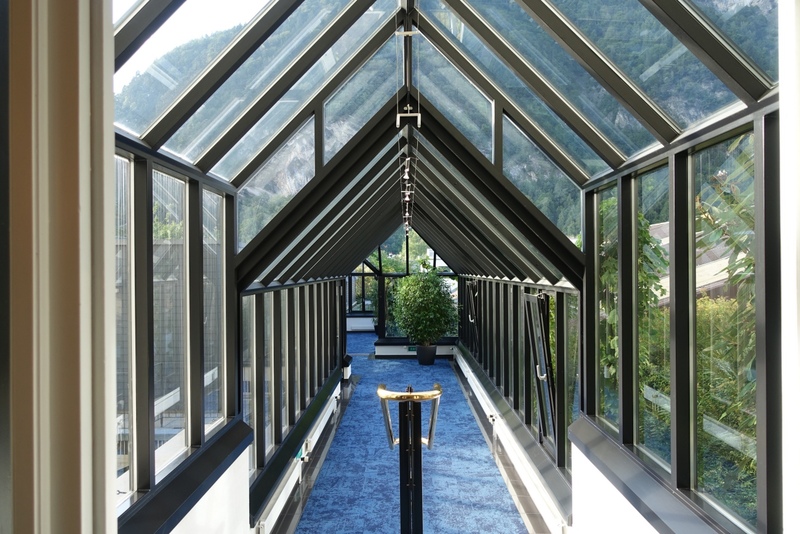 The Victoria-Jungfrau Grand Hotel & Spa is located at Höheweg 41 in Interlaken, about an 8 minute walk from the Interlaken West train station. If you instead are coming from the Interlaken Ost (East) station, it's about a 15 minute walk. We arrived on a rather grey and cloudy day, but there was a festive atmosphere everywhere due to the Unspunnen Festival, only held every 12 years. This very special cultural festival is believed to be the largest traditional gathering in the world, and activities celebrate quintessentially Swiss traditions: Alphorn performances, Alpine herdsmen, yodeling, Swiss wrestling, and Swiss folk dancing. The hotel was booked solid, so we did wait awhile before we were checked in. While waiting, I admired the lobby flowers, as well as the stained glass by the reception. Entry level Superior Rooms are 226 square feet, with a view of either Interlaken or of the Harder Mountain. We were in a Deluxe Room, which is slightly larger, at 269 square feet, with a view of Interlaken, including the Jungfrau, had it been a clearer day. Fortunately, we had a clear day the next day for our actual visit to the Jungfrau. 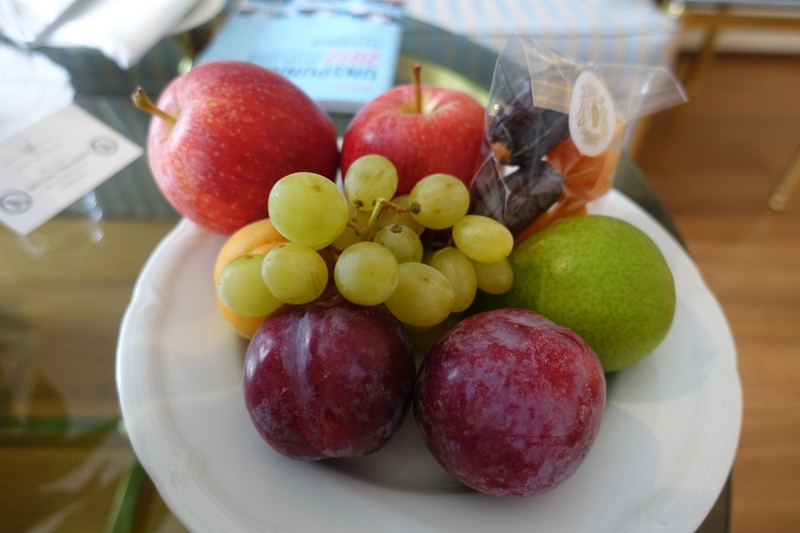 There was a fruit welcome amenity with fresh fruit, as well as some dried apricots and dates–handy to take along for our excursion the next day to Jungfraujoch. 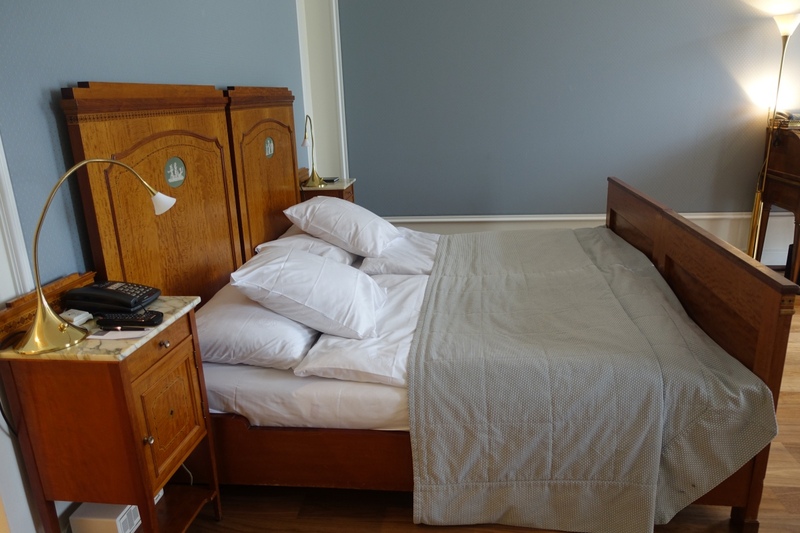 The bed was in the style of German Double Beds, with two separate mattresses and duvets. The bed was somewhat firm, but I managed to sleep well enough given our active day. 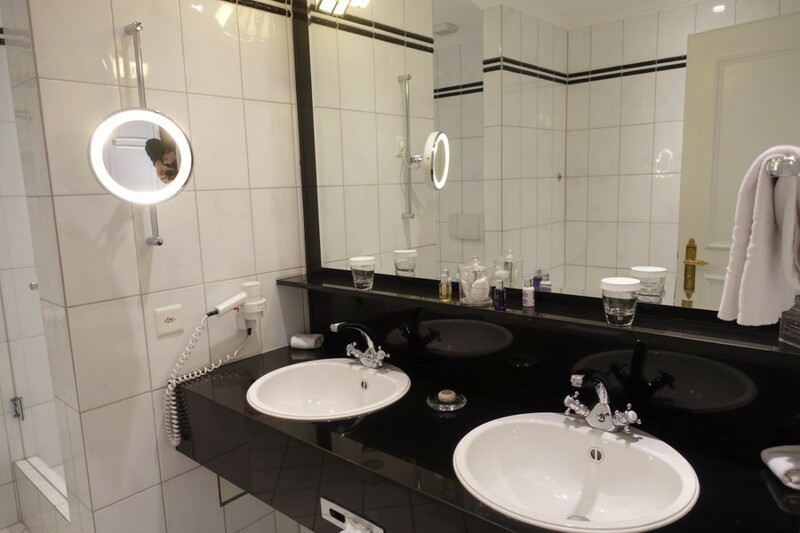 The bathroom had two double sinks, which I was happy to see, even though overall it had a rather clinical and spartan feel to it. I did appreciate the separate glass enclosed shower, even though it was a regular showerhead and not a rain shower. The bathtub had a retractable laundry line that was handy for hanging my wet swimsuit after a visit to the spa. The Spa Nescens is open 7am-10pm daily, except for Sunday, when it closes at 8:30pm, with spa treatments available from 9am-8pm. I didn't have a massage, but there was an extensive selection of treatments, from a Swiss Alpine massage, Thai massage and Shiatsu to Underwater massage and foot reflexology. I was surprised to see that the large main pool and indoor jacuzzis were deserted when I visited in the early evening, apart from one other guest. Then I discovered the exit to the outdoor salt water (but not seawater) jacuzzi, where 7 other guests were relaxing. That was clearly the place to be, and perhaps the hotel should have tripled the size of it. 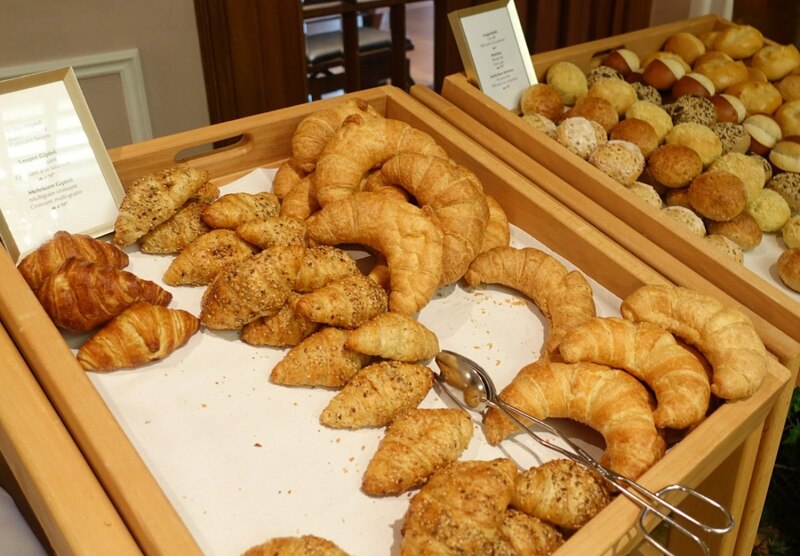 Buffet breakfast is served, starting at 7am, in the hotel's La Terrasse Restaurant. You'll be asked for your room number as you enter. 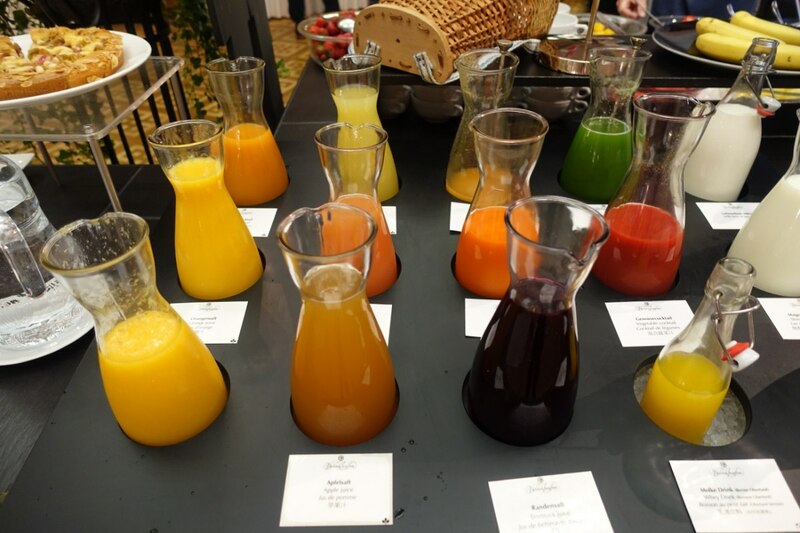 There were a variety of juices, although these ones were from concentrate. Instead, I was happy to see a pitcher of fresh squeezed orange juice, which turned out to be excellent. 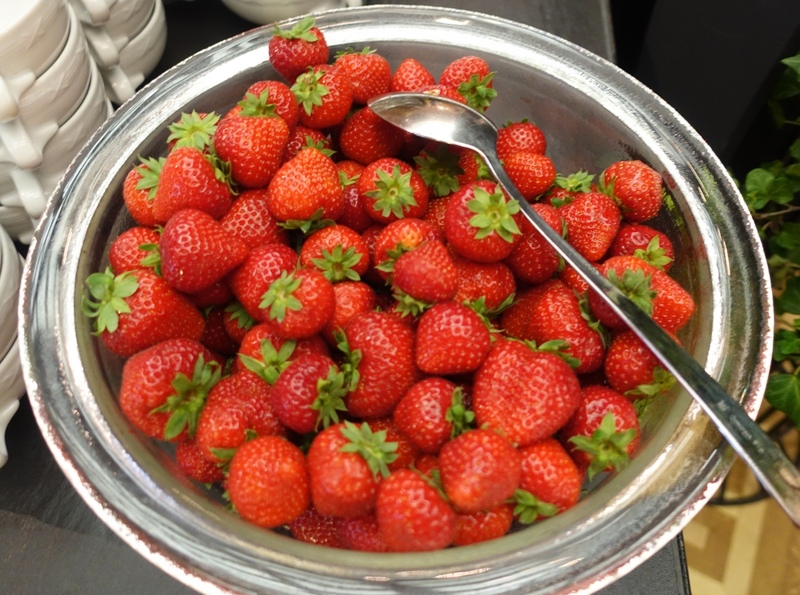 Fresh fruits included grapefruit, pineapple, orange, fruit salad, kiwi, and strawberries, as well as various fruit compotes. 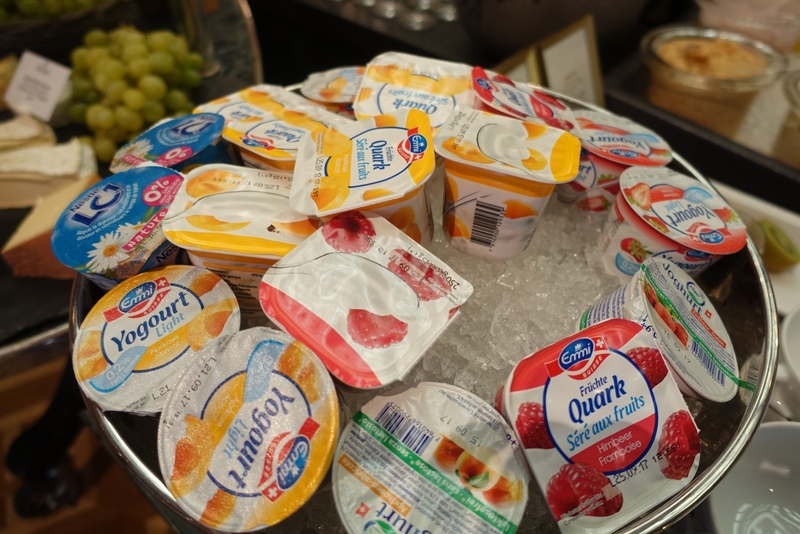 There were several yogurt and quark (fromage blanc choices) that were fine, although I give French yogurts such as Ferme des Peupliers (served at better French hotels and places such as Cheval Blanc Randheli and the Emirates First Class Lounge in Dubai) the edge. 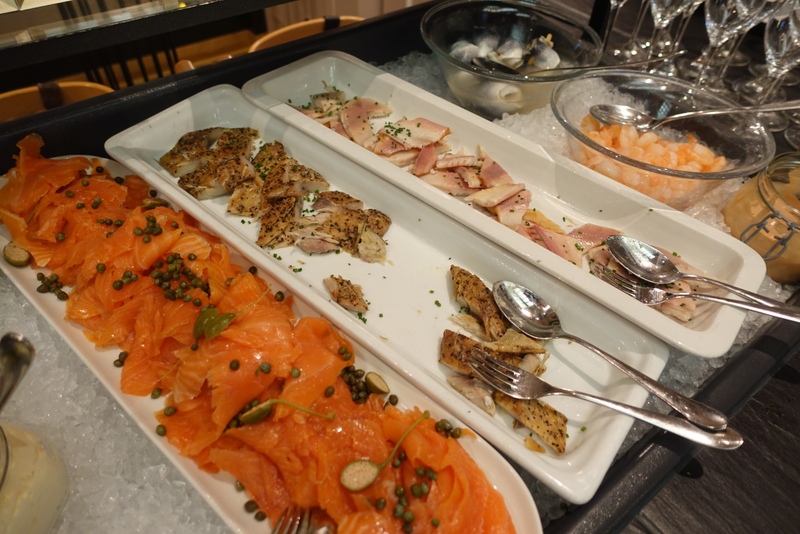 There was also smoked salmon, smoked trout, cold cuts, and Alpine cheese, which I especially enjoyed. 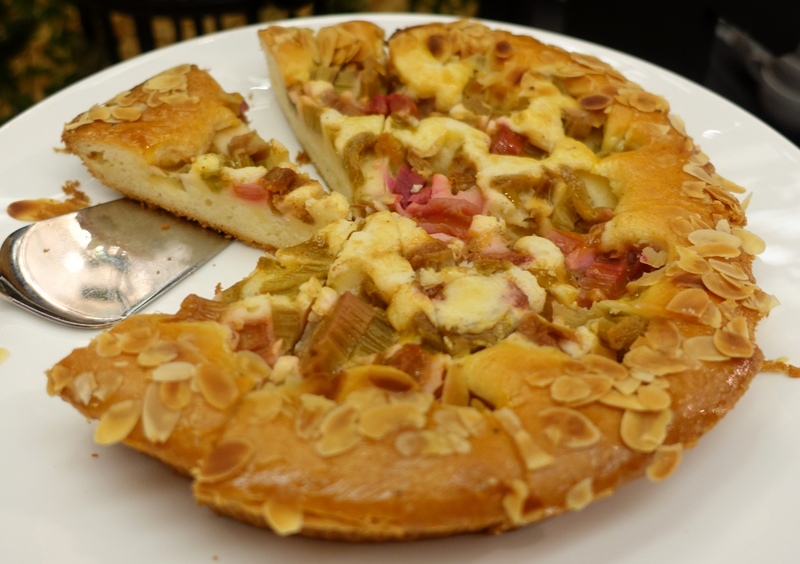 Breads and pastries included multigrain croissants, and a tasty rhubarb almond tart, among others. The Victoria-Jungfrau was extremely busy during our visit, which coincided with the end of the Unspunnen Festival. 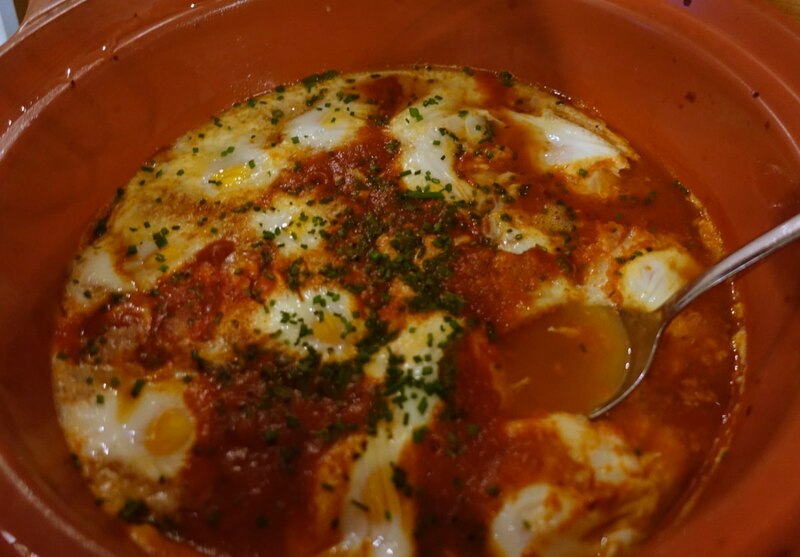 This perhaps accounts for some of the wait at check-in and more perfunctory service at breakfast than was the case at our other luxury hotel stays in Switzerland. 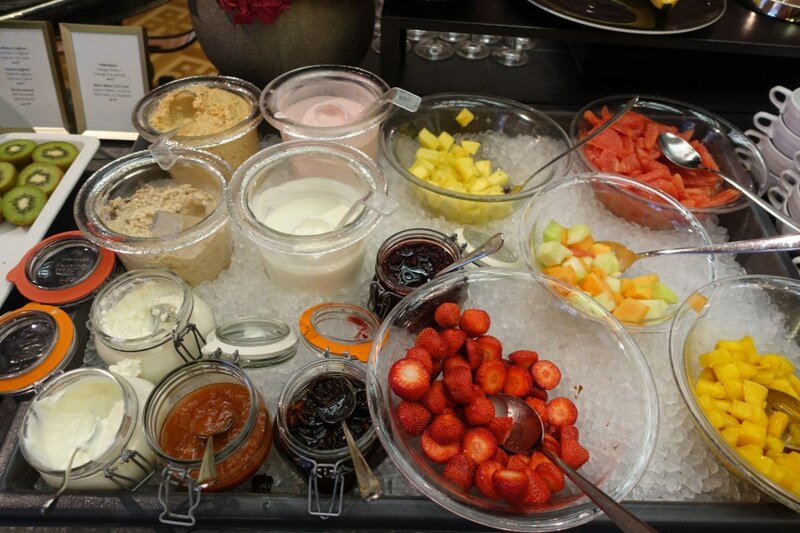 That said, the breakfast buffet itself was very good both in the variety of choices and the quality of the offerings. 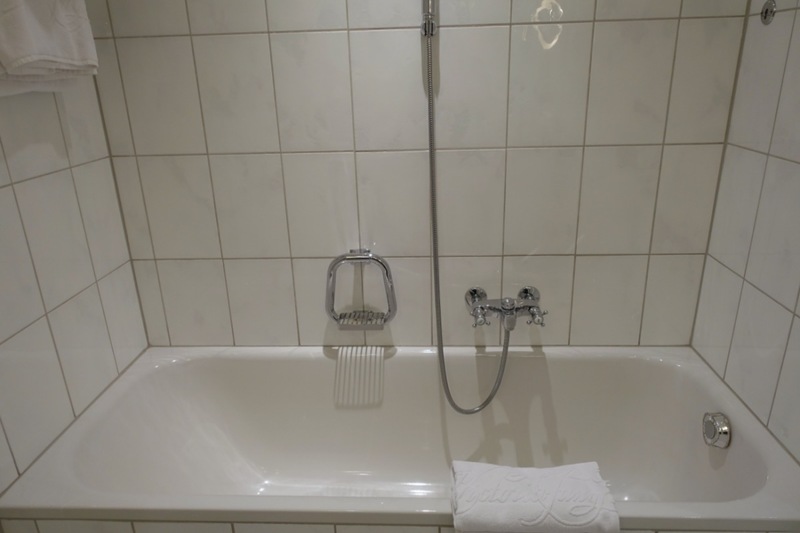 The Deluxe Room was comfortable but quite basic compared to the Baur au Lac, Four Seasons Geneva, and Lausanne Palace, but it did have a lovely view of the mountains, and, had it been a clear day, the Jungfrau. 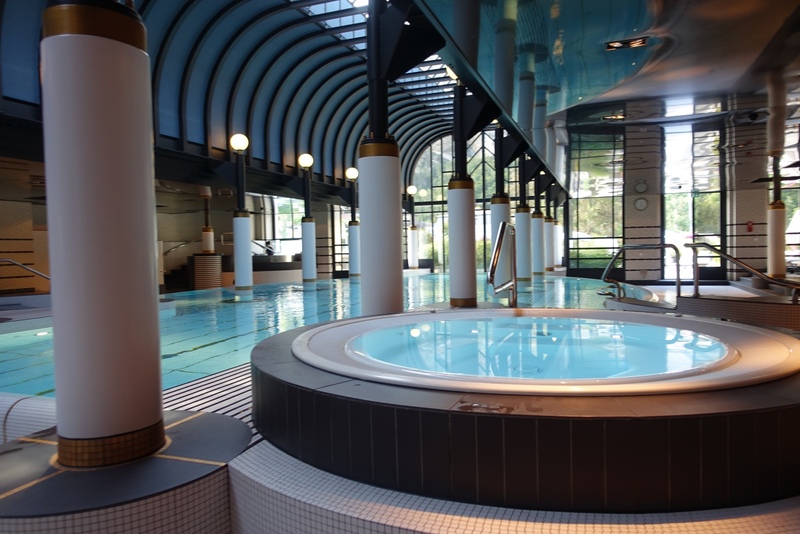 I did really enjoy the large swimming pool at the Spa, with plenty of natural light, and the salt water jacuzzi outside–although that was clearly the place to be, as it was quite crowded. 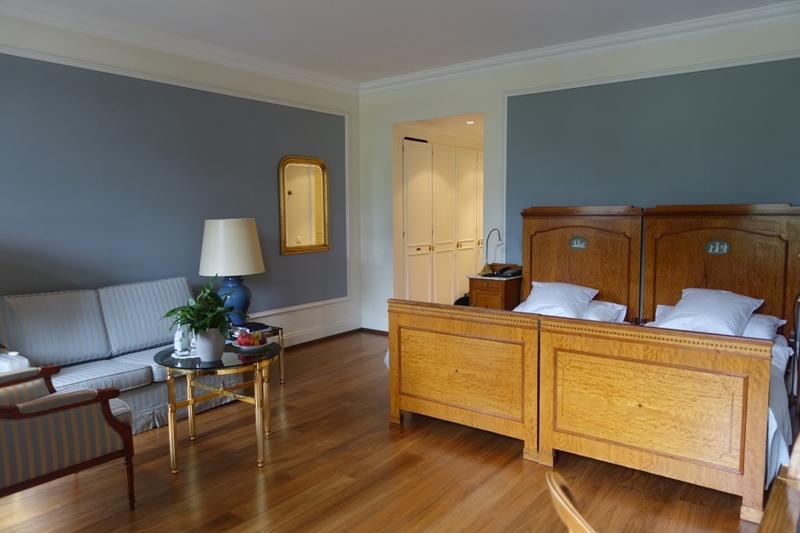 Overall, while the hotel may not wow the way some of Switzerland's other luxury hotels do, it's a very comfortable base for active days exploring the Jungfrau or adventure sports in the Interlaken area. 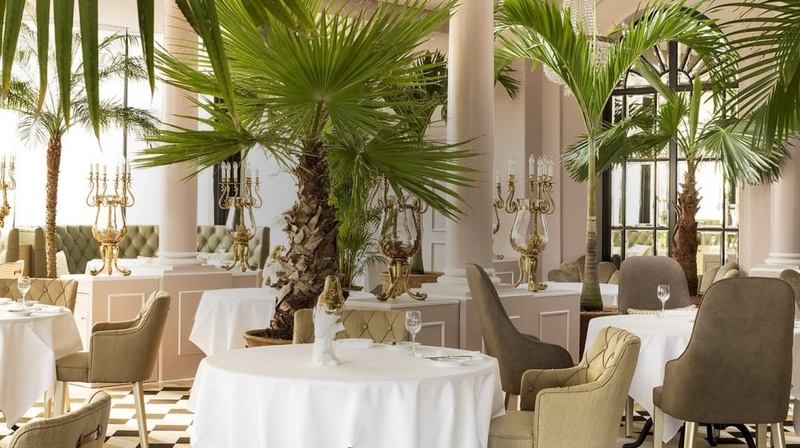 If you've stayed at the Victoria-Jungfrau Grand Hotel & Spa, what was your experience?